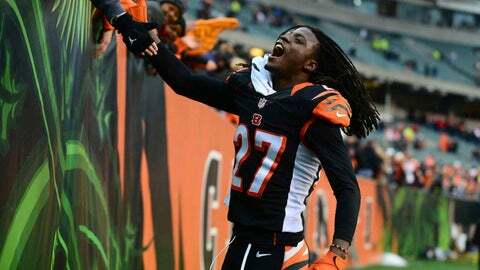 Cincinnati Bengals cornerback Dre Kirkpatrick (27) celebrates with fans after defeating the Baltimore Ravens 34-17 at Paul Brown Stadium. CINCINNATI — The Bengals will host San Diego in the AFC Wild Card playoffs next Sunday at 1 p.m. the NFL announced Sunday night. The Bengals (11-5) won the AFC North title for the first time since 2009, capping the regular season with a 34-17 win against Baltimore Sunday afternoon. They went 8-0 at home for the first time since 1988, which was also the last time the Bengals won the AFC championship and went to the Super Bowl. San Diego (9-7) made the playoffs when it beat Kansas City 27-24 in overtime after rallying from a 24-14 deficit against a Chiefs team that was locked into the No. 5 seed and rested a majority of its starters, including quarterback Alex Smith. The Chargers are in the postseason for the first time since 2009 when they won the AFC West with a 13-3 record but lost in the divisional round against the New York Jets. The Bengals are in the postseason for the fifth time in 11 seasons under head coach Marvin Lewis. This is their third division title since 2005 but the franchise is still seeking its first postseason victory since the 1990 season. The Bengals beat the Houston Oilers 41-14 on Jan. 6, 1991. They lost home games against Pittsburgh (34-17) in 2005 and the Jets (24-14) in 2009. The Bengals lost in the first round of the playoffs each of the last two postseasons at Houston as the No. 6 seed. The Bengals have won three straight games against the Chargers, including a 17-10 victory this season on Dec. 1 in San Diego. The Bengals and Chargers have played one time in the postseason.The Bengals won the 1981 AFC championship with a 27-7 victory in the famous Freezer Bowl game played at Riverfront Stadium. The temperature was minus-9 degrees and a wind gusting between 20-35 mph made the wind chill factor minus-59. There are still more than 10,000 tickets available, the Bengals announced Sunday night. If the game is not sold out before the NFLâs blackout deadline it would not be seen in the Cincinnati home market of Cincinnati, Dayton and Lexington. The NFL will set the deadline, which is typically 72 hours prior to kickoff. If the Bengals beat San Diego they will advance to face No. 2 seed New England on the road at 8:15 p.m. on Saturday, January 11.There are still plenty of tickets available for the game. On Thursday of this past week the Bengals said more than 10,000 seats were left.